Freeze the bananas and the chopped mangoes for 1 to 2 hours or until frozen solid. Freeze 2 or 3 tall glasses. When you are ready to serve, peel the bananas and cut them into chunks, setting aside a couple of slices for garnishing. 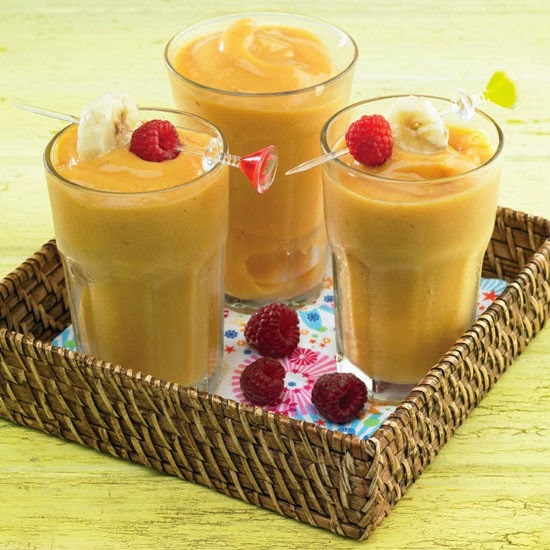 Quickly blend the frozen bananas and cut-up mangoes to a pulp, gradually adding all the other ingredients until well blended but still frozen. Fill the iced glasses and top with a slice of banana or mango or any other fruit. Prepare the basic recipe, replacing the mango flesh with 2 cups of berries or mixed berries. Replace the mango flesh of the basic recipe with 2 cups pitted plums. Prepare the basic recipe, replacing the mango flesh with the pulp of 2 baked apples. When preparing the basic recipe, replace the mango flesh with 2 cups chopped pineapple. Prepare the basic recipe, but replace the mango flesh with 2 cups pitted sweet red cherries.